I love Berlin, and in the late 1990s I wrote a very brief item in the Atlantic's travel section with some reasons why. (Link here; the item in its terse totality is after the jump.) At the time I wrote, I hadn't been back to Berlin since its reunification, and I worried that its smoky, feverishly-doomed evocative nature might have disappeared along with the Wall. In several visits since then, I've found I had little reason for concern. The place is spiffed up and modernized, but it is still plenty noir! Yesterday it was Berlin as I imagined and remembered it: raw, overcast, pouring rain, the noontime sun very low in the sky as it headed toward twilight at 4:30 and pitch blackness at 5. As we walked through the rain and wind and blear on Unter den Linden, I was thinking: This is so atmospheric! My wife, the reality-based member of our household, was thinking and finally came out and said: This is so miserable! This proved to be Berlinish serendipity. We spent several hours inside the museum, fascinated by, among many other things, a display of early-Nazi-era propaganda art. 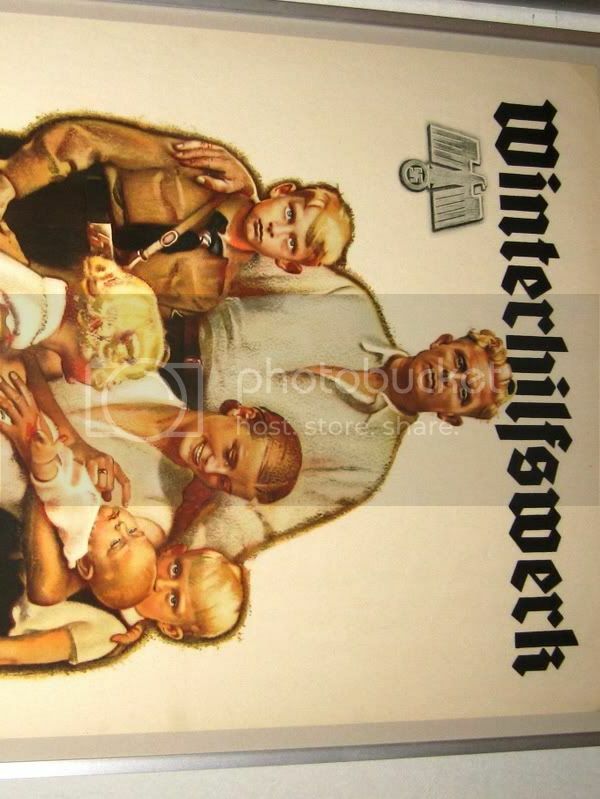 The guard told me to stop taking pictures only after I'd seen this Village of the Damned-style poster of a wholesome Aryan family. There is also a wonderful display of artifacts from the threadbare life of old East Germany, including a "pioneering" Robotron personal computer introduced years after the Apple II and IBM PC. This section was presented with the bittersweet tenderness of the movie Goodbye Lenin. The contemporary ingredients of a balanced news diet. Life is full of surprises. The real Berlin can be sunny -- in August even warm. But the Berlin I love in books is always dark at four-thirty on a November afternoon, chill wind on the Kurfürstendamm, everything damp, the light oily through the fog. In Brussels such conditions would merely be clammy. In Berlin they call up a melancholy decadence that makes the city irresistibly romantic and sad. The wartime horror of course shapes this sense of doom and mystery, but most of the appealing Berlin literature is set just prior to or after the war. Otto Friedrich's Before the Deluge, a prose equivalent of George Grosz cartoons, made me want to see the remnants of the flickering Weimar-era life -- the Bauhaus quarter where Walter Gropius's buildings still stand, the gritty Wedding suburb that inspired Kurt Weill and Bertolt Brecht, Lotte Lenya, "Mack the Knife." Thomas Berger's underappreciated series of "Reinhart" novels begins with Crazy in Berlin. This book, published in 1958, is much funnier than a John LeCarré novel -- yet it also set the tone of cheerless, tattered Cold War spying that brought LeCarré fame five years later with The Spy Who Came In From the Cold. Charles McCarry's The Secret Lovers and The Last Supper use the postwar Berlin of black-market cigarettes and hasty de-Nazification to much the same literary effect. Taking the U-Bahn to the deserted Olympic stadium, I could picture Hitler watching the black American track star Jesse Owens at the 1936 Games, and also Berger's and McCarry's furtive characters of the 1950s meeting in the shadows to trade secrets. I have not seen the city again since reading Philip Kerr's trilogy of wartime detective novels, Berlin Noir,or John Marks's recent novel about reunification, The Wall -- or, for that matter, since the Wall itself came down. No doubt the reunited Berlin is a cheerier, less complex and brooding place. But I suspect that as dark falls, in the cold, the mystery is still there.